An opportunity is available to undertake a PhD in Water Resource Management, on a 3 year scholarship ($21,000/yr + tuition fees). 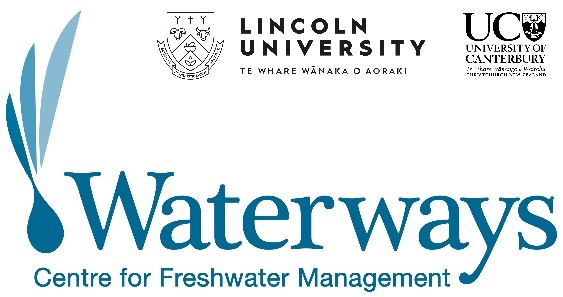 The research will be in the field of urban and/or rural water governance, and supervised by Dr Ed Challies <https://researchprofile.canterbury.ac.nz/Researcher.aspx?researchername=Ed%20Challies> at the University of Canterbury (New Zealand). *   Collaborative decision-making and water resource management planning under national and regional policy and its social and environmental implications (e.g. in Canterbury under the Canterbury Water Management Strategy, or in other regions under relevant resource management plans and strategies). *   Community engagement and community-based approaches to fostering urban waterway health and addressing urban stormwater contamination or other environmental issues in the urban water-environment (e.g. community initiatives and engagement to address a number of urban water issues – affecting stormwater, drinking water or wastewater systems, or urban waterways – in Christchurch City or other cities in New Zealand or beyond). *   Politics and discourses of water security in rural and/or urban New Zealand and beyond – potentially in relation to drought risk, irrigation, water storage and distribution infrastructure, drinking water supply, flood risk management, and/or climate change adaptation (e.g. exploration of chlorination of drinking water supply in Christchurch and NZ more widely, or irrigation and water storage projects across various regions). *   Familiarity with environmental issues and policy in Aotearoa/New Zealand, and ideally with water resource management issues, policy and planning. *   Experience with field research and familiarity with relevant research methods (e.g. key informant interviews, focus groups, surveys etc.) would be beneficial, but is not essential. *   A willingness to commit to full-time PhD research, and to commence study in Christchurch in 2019. The successful candidate will receive a fees scholarship and full 3-year stipend, as well as a research and conference budget. Workspace and standard resources will be provided at the Waterways Centre, University of Canterbury.